To find out more information about the apprenticeships we offer, browse the subjects below and click on the links. Why take an Apprenticeship with us? 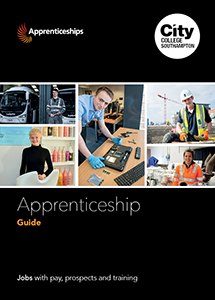 Click here to view our Apprenticeship guide. Alternatively go to our Prospectus page to download or order a printed copy. To view our latest apprenticeship vacancies, click here. If you have any questions, please get in touch and our apprenticeship team will gladly answer any queries you might have.